Warning lights give you important updates about the components in your vehicle. All of these lights appear when you first start your car, then switch off again for the drive – unless there’s an issue. When the Check Engine light stays on, you know you have a problem. 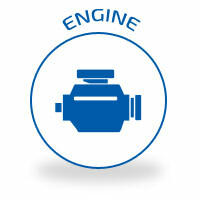 The Check Engine light can signal a variety of issues, from a loose gas cap to a serious engine issue. This small light can instantly grab your attention. Instead of being afraid not knowing what it means, bring your vehicle to Melton Automotive right away! Our ASE Certified technicians will inspect your vehicle, using expertise combined with sophisticated diagnostic tools, to identify the issue. The thorough inspection covers all major components from spark plugs to the transmission. Up-to-date technology and scanners retrieve codes from the engine computer to signal potential problems. Don’t ignore a check engine light! Have it inspected right away. If the light is flashing, immediately pull over and have your vehicle towed to our shop. A flashing light indicates a serious problem in the engine, and your vehicle may not be safe to travel on the road. Call 205.663.6088 right away to diagnose the check engine light and keep your vehicle safe on the road.